CARIN WESTER jacket. CÉLINE sunnies. MICHAEL KORS watch. ZARA sweater. TOPSHOP jeans. ZARA heels. KURT GEIGER clutch. This entry was posted in Uncategorized and tagged 30cancan, Carin Wester, celine sunnies, fashion blog, topshop jeans by Carolina Engman. Bookmark the permalink. the first picture with the windy hair is really cute. 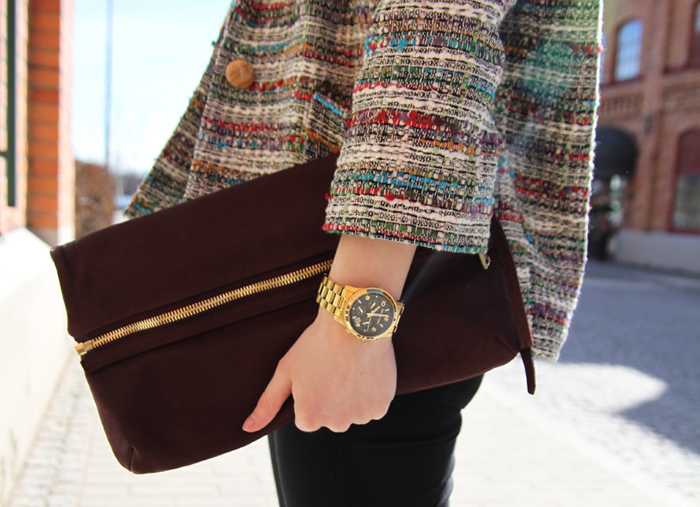 love how the tweed jacket colors work so great with the clutch! Great jacket indeed! And love your clutch! Amazing photos! I adore this jacket! Great pics, you look fab! Check out the give-away on my blog!! Aaaah,i am sooo much in love with these shots and your jacket! You look soo pretty when you smile!!! And your outfit is gorgeous as always! I love that jacket, great look! Really gorgeous jacket. I love the cut and material. So beautiful. Love the blazer and clutch!So beautiful! It definitely does look windy! But you still look so gorgeous, I love your jacket. I cannot describe how much I adore this jacket, it’s so beautiful and classy, very you! Love this outfit, really well put together – that bag is amazing! you look beautiful! Lovely outfit! I love the vest and clutch! woooo I love your look!!! Thanks 4 your comment in my BLOG. I follow in GFC and BLOGLOVIN, i’m waiting u.
I love your sunglasses so much! I need some Celine in my life ASAP! What a beautiful gem of a jacket! I adore your jacket, very sweet. Great outfit! I love the jacket. Great colours. Beautiful Pics! Love your jacket and your shoes! You should live in my city – it’s windy so many days of the year, it’s a surprise when it’s sunny! ADORABLE! you have such great looks- Inspirational! Beautiful images as usual! Very nice outfit as well, classic. Those heels are just great! Nice outfit! What a great jacket with the quality and colors! Love your shoes! Check out my $50 Gift card GIVEAWAY!!! Love the jacket and the whole color combination spiced with the red lips. love the colour of that Kurt Geiger. it really suits the fine details of your sweater. wish you a very merry easter weekend! Love the jacket!! And the purse is great too! what an amazing jacket ! I think it can make any outfit look chic ! Love your shoes, they’re amazing! And you’ve very nice jacket!!! I LOVE the zara heels, so so gorgeous. I love your sunglasses!!! So stunning!! love the jacket! crazy wind-blown hair in the first pic, haha, love it! Stunning photo and your hair looks like a million dollars! Beautiful jacket! It is quite lovely and who wouldn’t want it in their closet?! lovely!! and you always have the best clutches! i love the watch i finally got myself a michaler kors but mine is less gold, but i love yours!!! You look lovely, a gorgeous jacket! This MK watch look so great with this KG clutch! And I love the windy style in your hairs! you look amazing! happy easter! Love your outfit! Happy easter! Beautiful outfit, stylishly worn. Big fan. I’ve been looking for some great maroon-colored oversized clutch. And I’m in love with yours! Nice look! Such a lovely jacket , love your look . The look is so cute. Love the jacket. My must have for this spring!!! Cute look! Love your coat and sunnies! Okay I want your jacket! I like the clutch a lot… I don’t think the blazer fits you!!! Yet another perfect look, its amazing! But how I always love your pictures,oooh!Always flawless poses and places to compliment the outfits.LOOOOVE! omg ur wester jacket is AMAZING!!! love the color of the cluth clashing/complimenting ur whole outfit! Your smile is very beautiful! Love how you put the ensemble together. The sweater is such a great statement pieace§ I love the entire look and the quality of the photographs as well!